Diggers Valley: 2 July 2011. The week beginning the 2nd of July 2011. 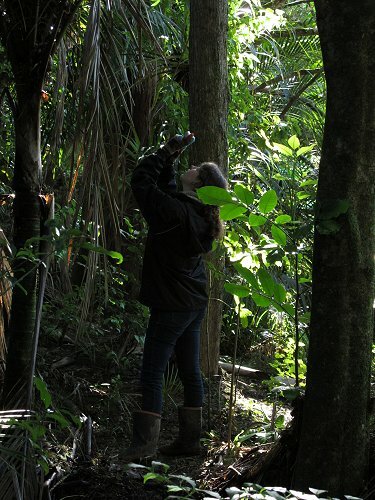 We took Jess for a wander amongst the big trees around the Northern Rata and the felled pine tree. As we walked, I kept an eye out for orchids, and there they were! They're so tiny and unimpressive to look at when standing, so we didn't linger, but I resolved to go back with the camera later - see Monday, Tuesday and Thursday. I'm not even going to try and identify which particular species this is. If you look at Hidden Forest's Identification Guide, you will see there are a great number of similar fungi. Jess left us again this afternoon, so we took a few pictures first. 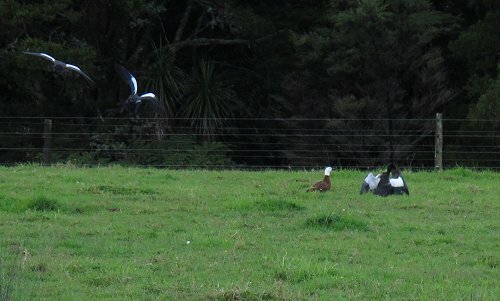 Walking back from moving the big bulls this afternoon, I could hear the flapping wings of these two fighting male Putangitangi - Paradise Ducks. 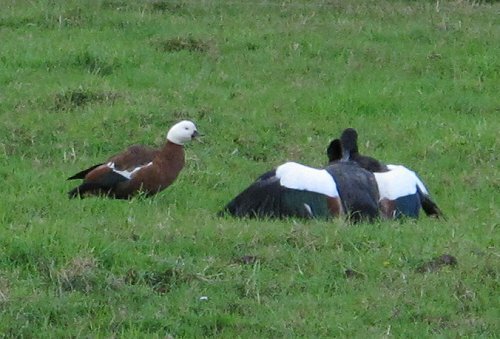 There are a couple of extra duck pairs here at the moment and they must be stepping on each other's territorial toes. Throughout the fight, which lasted for several minutes, the female mate of one dashed around squawking at them, and when the invader eventually moved to leave, she chased him away. From out on the flats I could see how much the cows had eaten of their paddock's first break. There's a fair amount of grass still there. Out the back, in the Back Barn paddock, I went heifer and orchid hunting and found both. 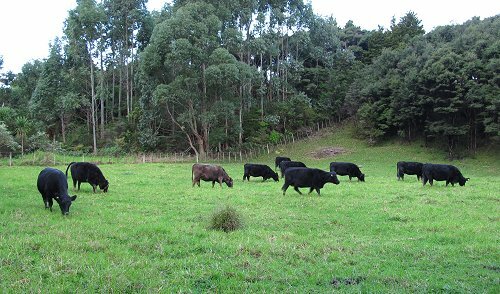 I let the heifers out into the Swamp Paddock and went for a wander around the places I've seen orchids before. 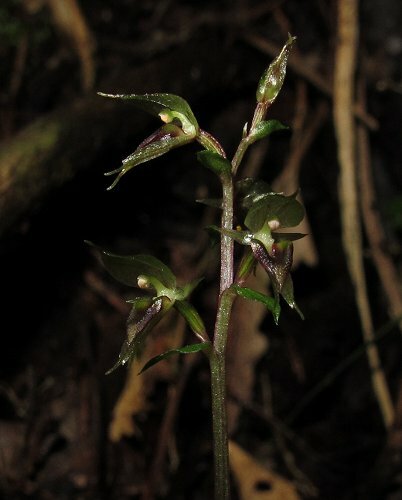 Most of the terrestrial (ground growing) native orchids are seasonal plants, only visible at certain times of the year. 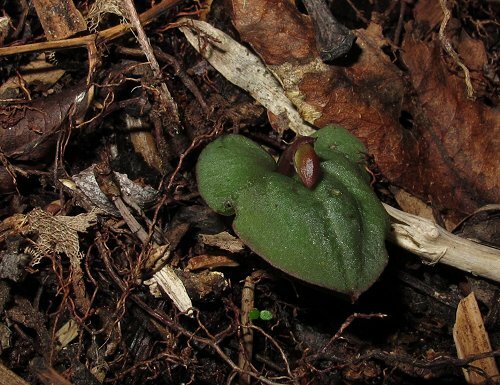 I could find no sign of the greenhood orchids, although they were hardly outstandingly obvious even in flower last year, so either I missed them in their early growth stages, or they don't start growing until later in the year. 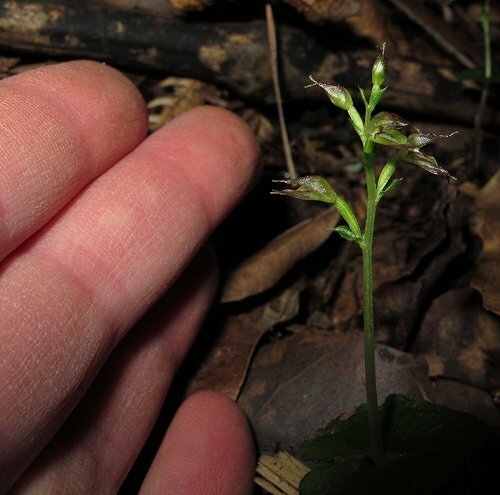 I checked a couple of particular spots in which I'd found Caladenia chlorostyla flowering last year, and found the plants growing, although they will not flower until September at the earliest. 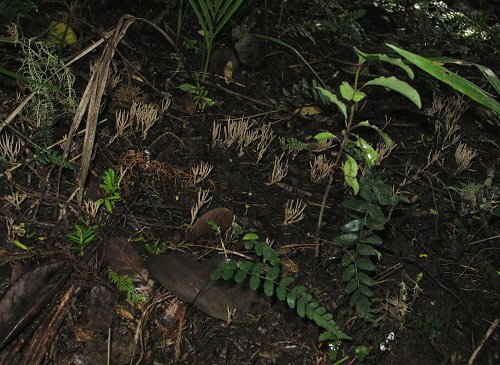 Most interestingly, I discovered a lot of small Sun Orchid plants growing on the ground in an area near the stream, beneath the canopy of some mature Kanuka trees. 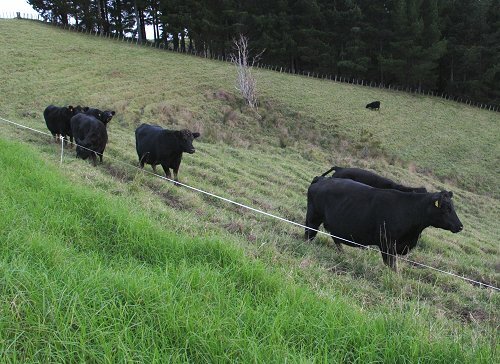 I'd like to try and protect those plants from the feet of the cattle, to see if they'll flourish and flower there. The weather has finally been dry for long enough - about two and a half days now - for the ewes' wool to dry out enough for shearing. As heavy grey clouds gathered again late this morning, we put them into the shed ready for shearing after lunch. The three pregnant ewes are about half-way through their five month gestations, so not too physically uncomfortable in this position yet; nor are their udders showing any development. 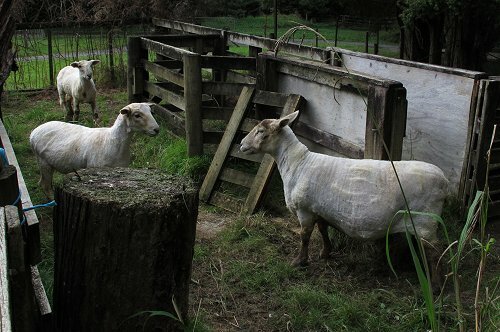 Dotty and her daughter didn't recognise each other when they met again after shearing. Sheep are really funny to watch when this happens. Ours generally have a few fights, butting heads and shoving each other around. 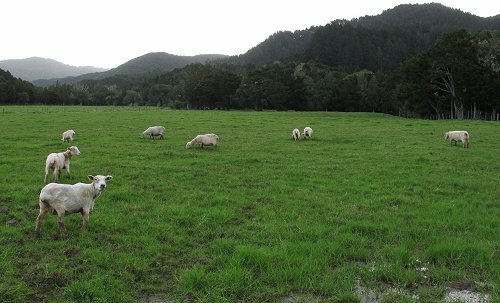 While Stephan was still shearing the ewes, I went out and set up the gates so they'd go up to the Windmill Paddock. 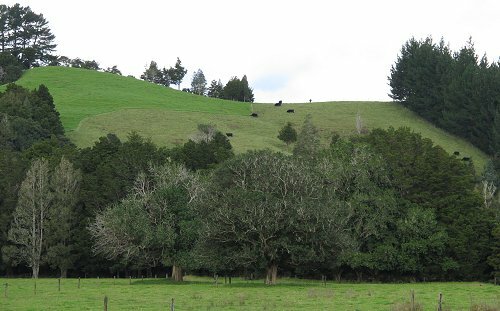 I wanted the ewes to have access to the big thick Totara trees at the other end of the paddock for shelter in the next few days, while they get used to their reduced wool cover. Looking up to the hill over the road, I could see the cows were obviously thinking it was time for some new grass! I went up to check on the cows and see if they really did need a move yet and decided that they'd done a good-enough job on the first break. They galloped through the gap I created by winding up a bit of the electric tape down at the reserve fence. We sent the sheep up the lane and after I'd put them into the Windmill Paddock through the wet and muddy gateway, they all came back out under the three-wire fence and spent most of the night in the lane. 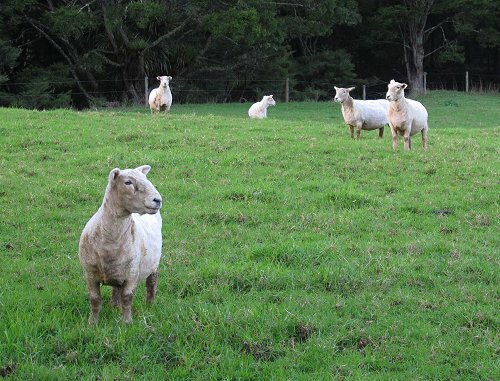 I'm keeping them out of the House Paddock until it's time for lambing, so that pasture remains as clear of intestinal worm eggs and larvae as I can keep it. 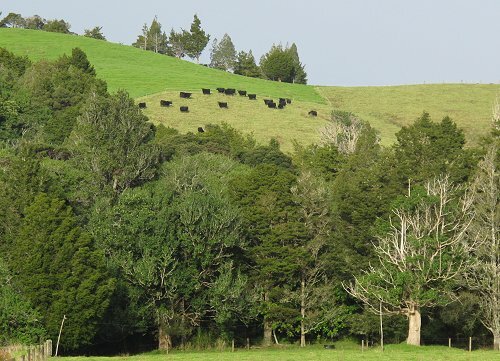 Cows and sheep have different parasites, so having grazed the House Paddock with cattle on several occasions since the sheep were last there, it'll be relatively "clean" when they eventually go in. 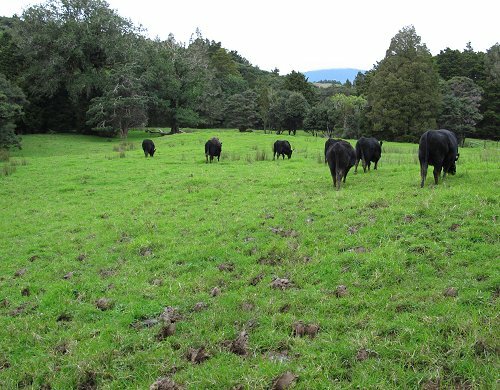 As the heifers walked into the Frog Paddock this afternoon, it was obvious how soft the ground has now become. I finally got back to the orchids near the big Pine tree. 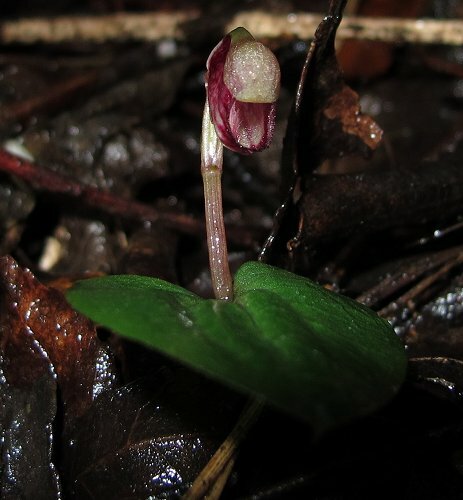 This is the tiny Pixie Cap orchid, Acianthus sinclairii, which grows mainly in quite dim areas under mature trees. A closer shot of the orchid. And here's something new! I wonder what's inside that bud? There were a few of these plants around, many with their buds nipped off, possibly by possums or rats, or maybe eaten by slugs or snails. I built a cage of sticks around this plant, hoping to ward off any four-legged orchid muncher which might stop me seeing what the flower looks like. I regularly discover trees I've not noticed before. I was thrilled to discover Titoki growing down near the river in several places last year, but there's been one up here on the hill over the road all the time! Here it is, with it's lovely foliage right out on the edge of the stand of trees. I must have looked at it a hundred times, but have never seen what it is. 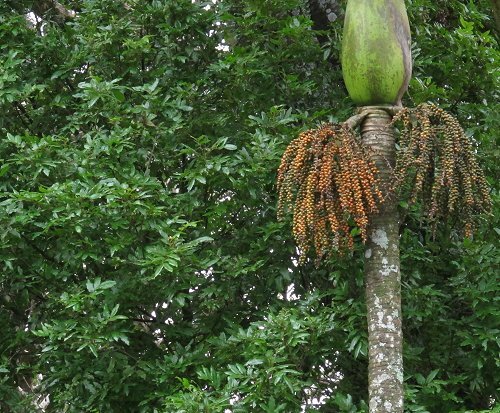 In the foreground is a Nikau palm, with ripe fruit, which the Kukupa (pigeons) love to eat. Back down to see the orchids again, and this time I wanted to take a picture with some indication of the size of these tiny flowers. When you're standing looking down on them, they're hardly noticeable. 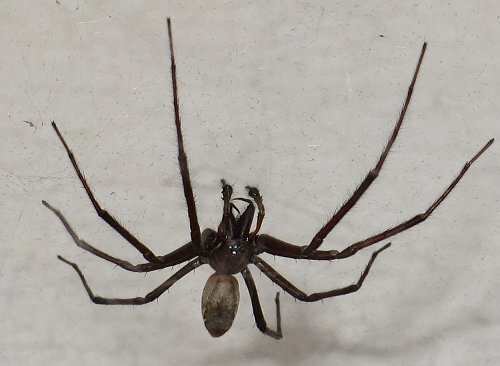 I thought about removing the spider web from the bathroom yesterday, but didn't get around to doing it. Today we have a new resident! I think this one is male and he seems to have moved in to stay. I think he is smaller than the last male we saw, which was about the same size as our then resident female spider. 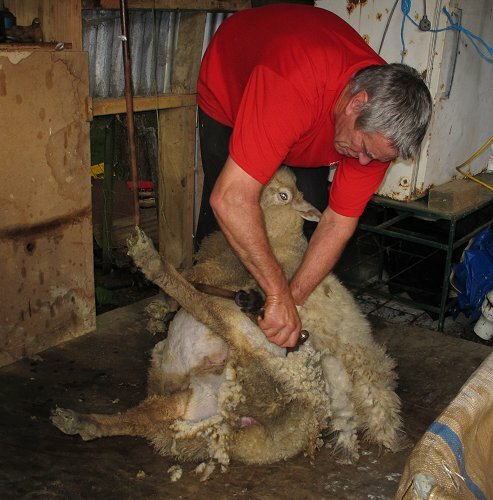 The sheep seem to be surviving, without noticeably shivering and the silly upside-down ewe has stayed upright ever since shearing. I have gone to the window to count to eight several times every day to ensure she's not stuck somewhere, but it seems that the problem, for the time being, is solved. No doubt she will have trouble again as she gets closer to lambing. Ah, I haven't seen this one before! 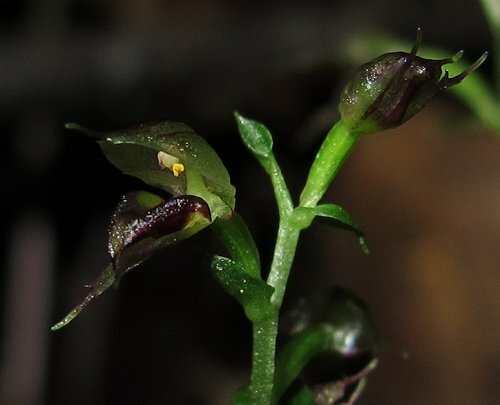 I've taken photos during the week as the flower has gradually opened and spent time looking at the Native Orchids Group website, but was only with this picture able to make a reasonable guess at the orchid's identity. It is Anzybas rotundifolius, which the website's entry tells me is "At Risk - Naturally Uncommon". Unfortunately this little colony of the species is definitely at risk, a huge Pine tree having been dropped in the middle of it. Hopefully any plants under the trunk will survive a long period of enforced hibernation and the breaking down of the trunk over time won't affect the others. We were going to drag the logs out of here, but I'm glad now that we didn't, because we would probably have damaged the whole area. And while we've accidentally squashed an area of lovely orchids, at least our care in dropping the tree meant we didn't destroy them altogether. 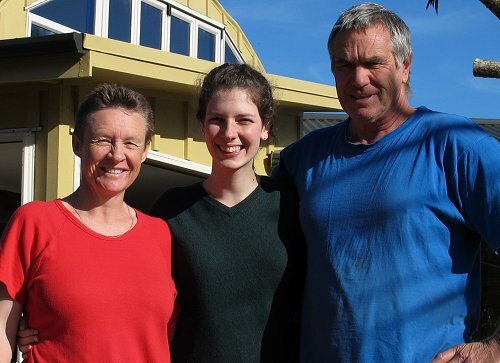 We spent the day in Whangarei with my mother, Jill, helping her prepare for her departure to Auckland, on her way to England to visit her sister and other family. While there we also did a bit of shopping and bought exciting things like big containers for the kitchen, for flour and sugar (Stephan liked them very much), and a clever cord which connects our ute's stereo to Stephan's tiny MP3 player, so we no longer need to carry CDs with us - which is a good thing, since all of the dust from our roads has made the CD mechanism unreliable now. We think it's a fine thing that we're so easily pleased. People with more extensive and exciting tastes may look down upon our simplicity, but we turn away from their rampant consumerism! This page marks this website's Tenth Anniversary! I have not counted how many pages I have written in that time, but it has been a significant effort. There are a number of reasons for my continued industry: I carry on on the basis that "I've started, so I'll finish"; this is a really useful, easily searchable farm diary for my own reference; and very nice people often write and tell me how much they've enjoyed reading, some because this is quite unlike their own lives, and others because they've experienced a problem similar to one I've described and have either learnt something new, or have a helpful suggestion to make. That contact with readers has been the greatest reward. We've met many lovely people as a result of their finding this site and writing to us, and we hope to meet many more. Thank you all for reading.